Toenail grow from a root at the base of the nail called the germinal matrix at a rate of ____mm per month. If a portion of the nail begins to dig into the skin surrounding the nail, it will begin to damage the tissue. This elicits an inflammatory response causing redness, intense pain, and swelling. A clear or cloudy puss can exude from the damaged and inflamed tissue. A vicious cycle of inflammation and pressure from the offending toenail can occur leading to intolerable pain with any pressure on the nail. 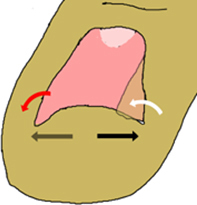 Sometimes a person’s toenails are naturally wide (black arrows) or the nailfolds deep (white arrow). This can predispose to ingrown toenails. The nail can also curve into the toe (red arrow) so that any pressure on the top of the nail gets transferred into the nail folds causing chronic irritation and pain. 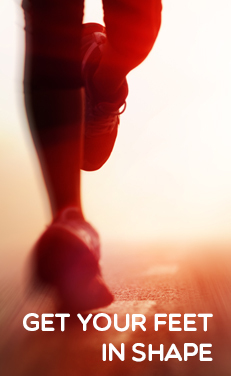 Pressure from a shoe that hits the end of the toe can contribute to the development of this. By far the most common reason for ingrown toenails is improper nail care especially in people with deep nail folds. 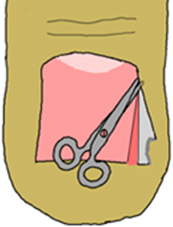 If the nail cutters do not cut the nail all the way on the edge, then the very edge of the nail will rip leaving a ragged edge that begins the inflammation of the skin around the nail. The best treatment is prevention. Avoid aggressively rounding the edges of the nail. You do not need to cut the end flat and leave sharp corners, but only cut what you can see and only cut if you can get the end of the clippers past the edge of the nail easily. Once an ingrown toenail has started, antibiotics and soaks can occasionally solve the problem. More commonly, the burr on the edge of the nail will have to be removed. This should be done by a physician or another health professional. 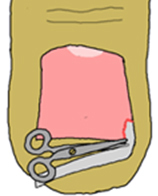 The end of the toe will need to be numbed and the edge of the nail resected. Many satisfactory techniques exist. One is illustrated below. If the ingrown toenail recurs, permanent surgical alteration of the nail is necessary. This usually involves the destruction of a portion of the nail root either through surgical cutting or chemical burning.